Alternate Names: Besta svarið, Sano Suoraan!, Sig Noget!, Zeg't Maar!, Znáš Mě? 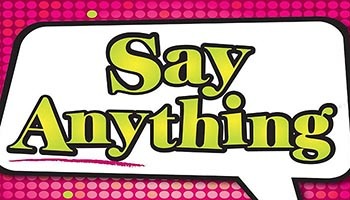 Say Anything is a pure party game. It was designed to get a party started as quickly as possible by prompting people to talk about interesting things and to make ridiculous statements. 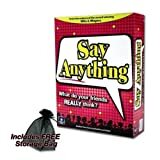 If you are looking for great social interaction and lots of laughs, then you will probably enjoy playing Say Anything. For instance, "What is the most overrated band of all time?" or "Which celebrity would be the most fun to hang out with for a day?" So dig deep into your heart or just come up with something witty - this is your chance to Say Anything! Everyone else writes an answer and throws it face-up on the table as fast as possible. No duplicate answers are allowed! Everyone else has two betting tokens to bet on which answer you chose. They can bet both tokens on one answer or split them between two different answers. Q: It's my turn. Can I try to influence other players? A: No! If it's your turn, you cannot influence what other players write. You also cannot hint at which answer is your favorite or help the other players guess which answer you picked. However, feel free to share all your thoughts after your favorite answer is officially revealed! Q: It's not my turn. Can I lobby for my answer?